Let's just say I am MAD for bamboo--its informal chic, not its Asian style. I always look twice at bamboo items, from rattan magazine racks to tortoiseshell blinds, even the metal Chinese Chippendale chairs I found for my table. I certainly couldn't pass up these gold bamboo frames for fifty cents apiece. They've been in the garage for a while, but today we'll swap the paper cuttings inside for art by the kids. Don't throw those paper cuttings out though. They could be used in some other way. They do look a bit sparse in those frames though. 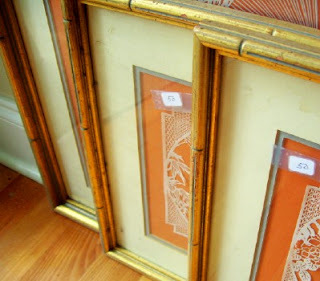 The paper cutting design inside the frames look very interesting, be carefull when removing them, they might be valuable. Based on the interest just in the comments I'm thinking the paper cuttings would make a great e-bay offering. This post reminds me how valuable it is to *know* one's tastes -- it can save both time and money at yard sales to not get distracted and bogged down by things that appeal at the moment and then sit in a closet until one's own yard sale. I can just see you heading out on a Saturday with your "bamboo and smocked dresses" radar set. I love a good find like those frames! And I enjoy your blog! I'm sorry I don't get to comment very often but I try to read here on a regular basis...just wanted you to know! Keep up the good work! Other fun things to frame are copies of pictures from your child's favorite books. I use the actual book if it is falling apart. The art is often beautiful and it makes everyone in the family smile.